We often obsess over keywords, key search terms or whatever else we like to call them. We boil it all down to combinations of words and the number of times users will search for each of them. But behind every search, every Google search box filled with words, there’s a user, a person. And behind every person, there’s an intention, a need, a reason for performing this Google search. 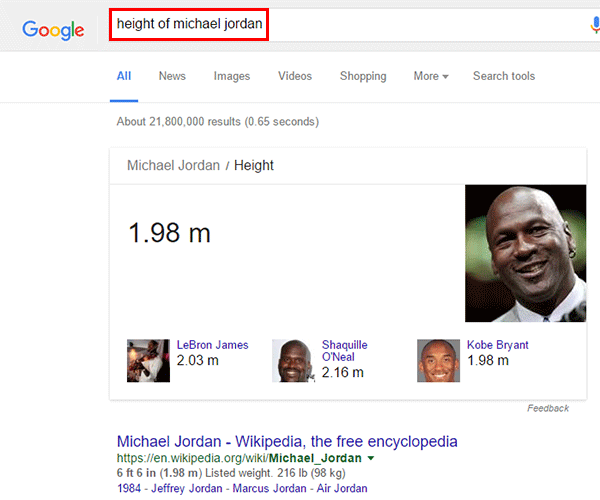 In this respect, I think Google’s ahead of us when it comes to SEO. We’ve always trailed in the search engine’s wake, and this is no exception. Suddenly, Google’s learned how to identify what the user wants via their searches, and has caught us off-guard. Now we need to understand what search intentions are in SEO and how to make use of this information to improve the positioning of our projects and/or clients. For more than a decade, Google has almost exclusively used on-page factors (page content for ranking) and off-page factors (particularly external links and backlinks) to determine which pages to show in the results for each search. But a while ago, it successfully introduced a new and highly decisive factor: user signals. In other words, it no longer focused solely on the websites it found online, but also on how users reacted and behaved in relation to each of the results it displayed. Beyond the conspiracy theories (which explain away every action Google takes by pointing to its advertising model), we can assume that this is what Google intended from the start: to offer users the best search results. Now, finally, it would appear that users themselves are the ones who decide. User signals are the variables that a search engine can measure and compile in relation to users’ behavior and reactions to the results of each search. When Google started to give itself away, speaking openly about these user signals and revealing certain patents that made its intentions clear, a section of the online marketing community was aghast. However, everything suddenly fell into place, because Google allowed us free use of the powerful Analytics tool in order to obtain information it would use in its algorithms. 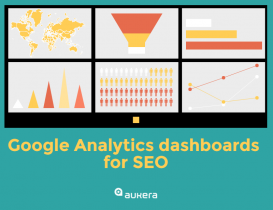 There are still many who claim that Google examines our web analytics reports in order to obtain data such as dwell time and bounce rate. Personally, I don’t believe it. Why? Because, among things, they don’t need to. There are several signals that can be easily weighted and which Google can compile from its own SERPs without any difficulty (it may well have already been doing so for many years). Based on these signals, the search engine can determine which search results are working best and adjust its ranking for different searches accordingly. The two simplest and most common examples are CTR (click-through rate) and pogo-sticking. CTR is a percentage that expresses the ratio between the number of times someone clicks on a search result (or online ad) and the total number of times that result or ad has been displayed. Pogo-sticking refers to those users who, after arriving at a website via a search result, go back to that same results page in order click on a different result. They usually do this because the first page they visited didn’t meet the need implicit in the search. The term “pogo-stick” comes from that infernal kids’ toy consisting of a stick with a spring, which you could bounce around on joyfully (until you fell off and broke a bone). In practice, this means it’s increasingly harder to “trick” Google. If your page isn’t relevant for the user’s search intentions, you can’t position it within the first few results. We could even go so far as to say that, over time, your page will fall down the rankings as a result of users’ behavior. In reality, is it worthwhile achieving a good position in searches that don’t match our target user? The answer, obviously, is NO. The clearest example is short-tail searches, those general searches that usually have a great deal of search volume but very little direction. Here we can see how, even up to the seventh result (and after tons of ads) there are no results corresponding to football boots. Coincidence? Not any more. 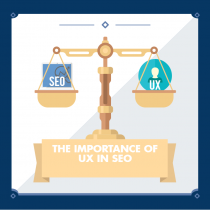 Before, it might have depended on certain brands’ SEO efforts, but now, it’s the user that decides – as we explained earlier – which results are the ones that should appear first. 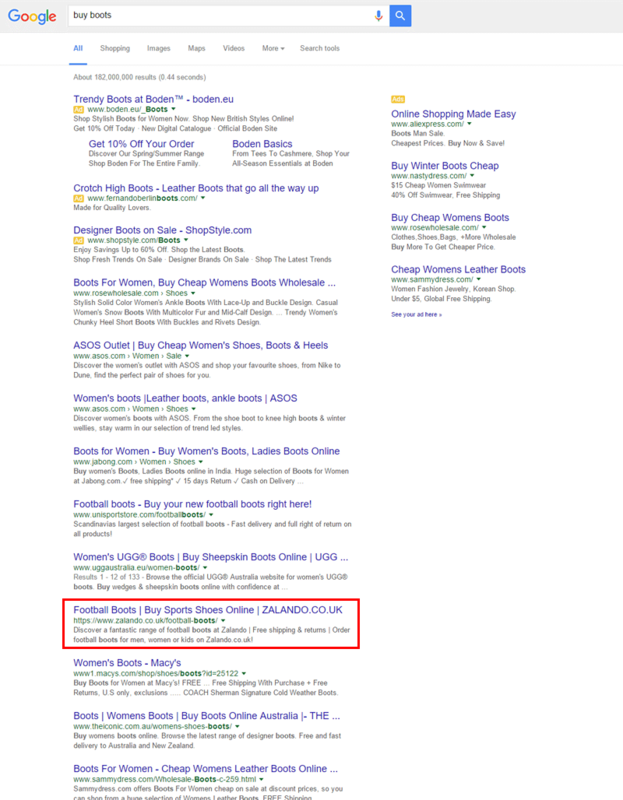 Google places football boots last because it knows there’s an interest (albeit a very small one, in relation to the level of interest in women’s boots) in these products and, one way or another, it wants to find a balance in the results it displays. Google tries to please everyone, which, as we know, is very complicated. Of course, Google works to personalize these results, so that a given user with identified habits (whether via his/her Google search profile, browser history or cookies) can obtain different rankings. It does this by applying user signals that are personalized (for said user) or segmented (for the user groups to which said user belongs). The possibilities for the future are immense. Going back to the example of “buy boots”, we’re only referring to “semantic” differences. In other words, both cases (football boots and women’s boots) are transactional searches with a purchase intention, albeit for different (but terminologically related) items. 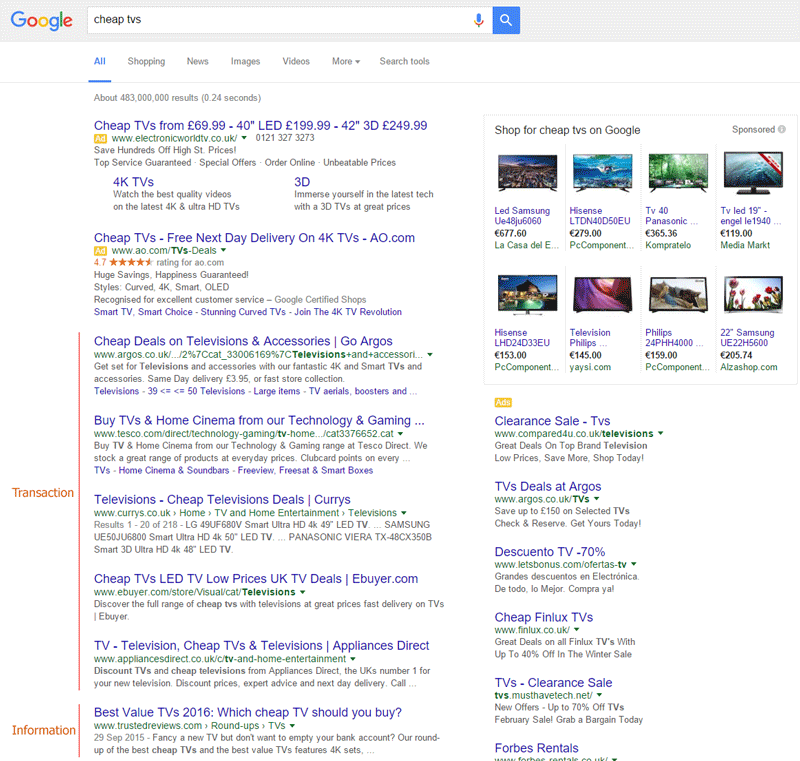 What happens when the same search can have very different search intentions? For example, some users want a transaction, some want information, some are looking for a specific website, some want to find a business in their neighborhood, some want videos, etc. It’s fair to say that Google no longer simply orders the best websites for each search; rather, it orders the best type of result (e.g. products, posts, news articles, videos, etc.) and looks for the best result(s) for each of these types. In other words, we’re no longer competing solely for one keyword within a series of 10 search results on the first page. Now, for the same keyword, we’re potentially only competing for one position within those 10 results (as in the “boots” example), or two, or three, according to how our content is oriented and the type of search intention it responds to. Google will conduct tests for different types of content and different pages of content for each type. It will alternate different results until the user signals indicate that, effectively, it’s produced the right result. 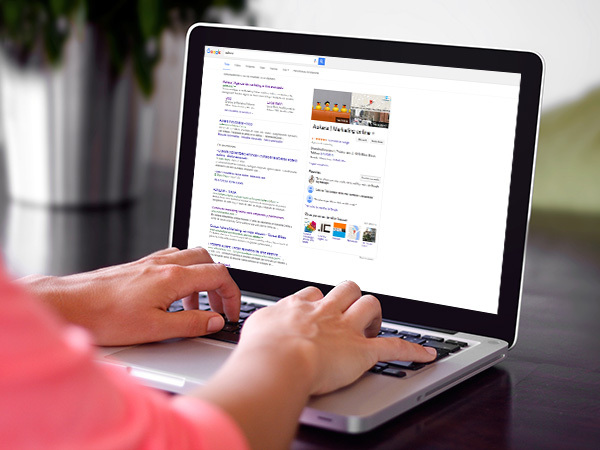 The closer the first SERP result gets to 100% of clicks, the closer it is to its objective. In fact, that’s where the potential of direct responses lies: there are times when Google is so convinced of the answer to the user’s query that it saves him/her the trouble of even going to a website. A supreme example of click-efficiency. 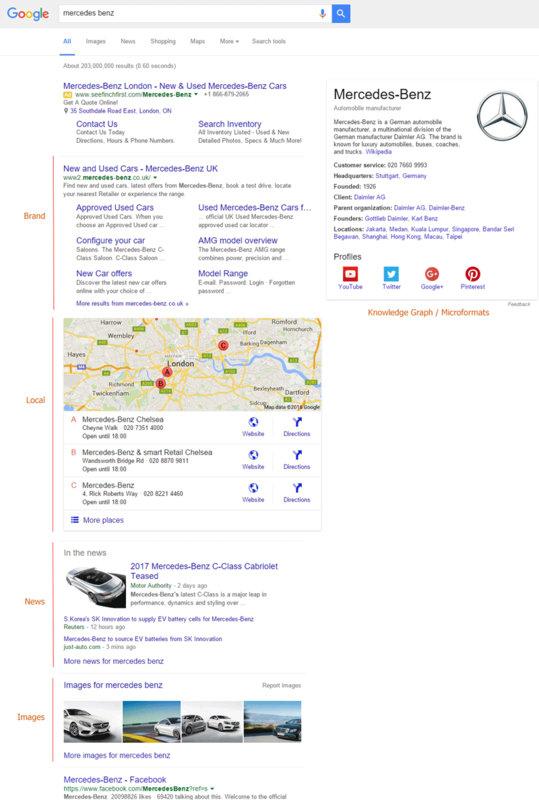 Below we can see how Google search results are clearly segmented according to the different types of search performed. If we want to appear in these searches, we’ll have to bear in mind the type of content displayed in each case and orient our content correctly. In this instance, the user signals have led Google to think that the most popular search intention is for nearby local businesses (i.e. 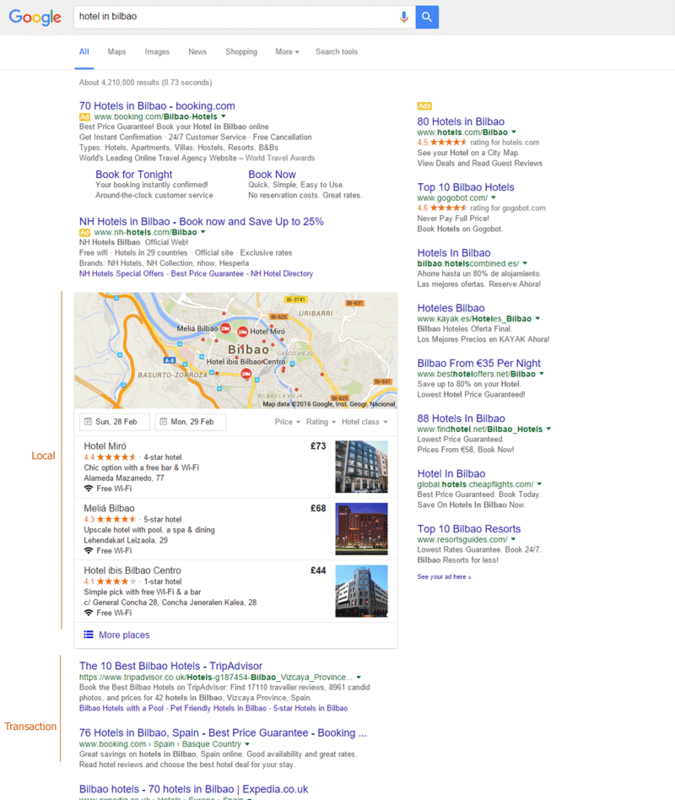 hotels in the Bilbao area), followed by a desire for transactional content (i.e. content oriented towards booking a hotel). Here it’s clear that the search intention for “cheap tvs” is transactional and that the majority of users want to find a page where they can purchase a product. However, there is also a small group that reacts positively to informational content. Google has got a pretty good handle on branded searches. It knows that the most popular search intention is the brand’s own website and that, depending on the sector, users may be looking for images and/or videos, or local results (in this case due to the existence of dealerships and garages). In areas of general interest, sites with a high level of recognized authority tend to come out top, undoubtedly because users are more disposed to click on them and trust their content. 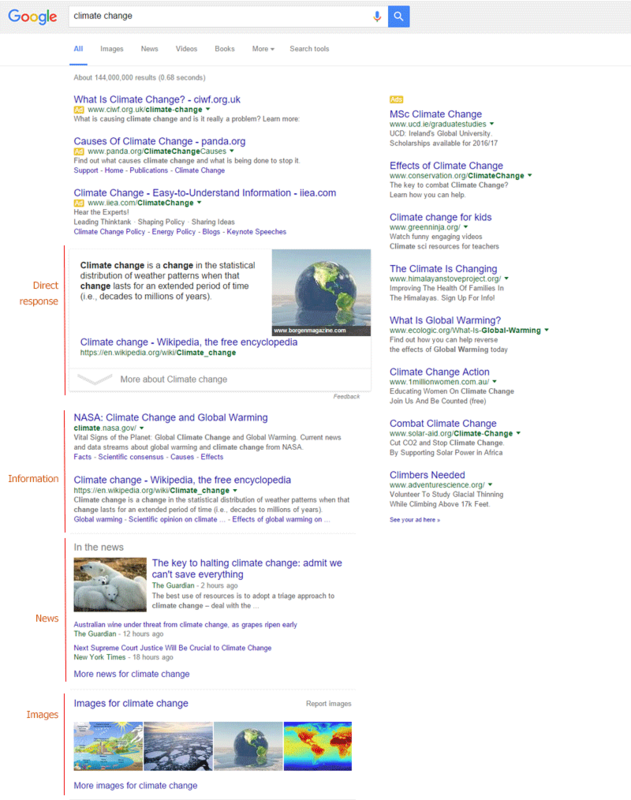 In this example, the search intention is varied, ranging from a definition (common for users in education) to general information, images and news. When we’re faced with an ambiguous search (keyword research, for example), the SERP can help us determine the user’s intention. In this instance, the search for “swiss alps” is often linked to a demand for (beautiful) images and videos, as well as general information and, finally, transactional content, although the average user will not be far enough down the conversion/purchase funnel to book a trip. Bearing in mind that Google compiles user signals, the “freshness” of our content becomes particularly relevant. It’s difficult for a website that has already been “downgraded” by Google from the first search results in the ranking to recover its position. We can try, by forcing a peak of interest, but it requires a great deal of effort. From an SEO perspective, a better alternative to updating an unsuccessful post, provided we wouldn’t be throwing away a large volume of backlinks, is creating a new, optimized post. Maximizing the visibility and attractiveness of the snippet. Adapting the content to meet the user’s needs. In other words, we need to ensure that we’re ranked among the search results, that we’re preferred, and that when we’re chosen (CTR +1), the user isn’t disappointed by the content s/he finds and therefore doesn’t need to return to the SERP (pogo-sticking = 0). We shouldn’t forget that good old traditional SEO, in the form of on-page/off-page keyword orientation, continues to be important. If we can’t achieve relevance/authority then we won’t even be among Google’s candidates for keyword searches. One of the most common recommendations for improving CTR is to include the brand name in the title. That way, it’s more likely that branded searches will lead to a click, and other search types could lead to a click through brand recognition. In the worst-case scenario, if the user doesn’t know the brand, at least we’ll have helped raise awareness of the brand in his/her mind. Another common recommendation is to optimize the Description meta tag from a “persuasion” point of view; not just in relation to keywords, but also by generating calls to action that encourage users to click on our snippet (and not those of our competitors in SERPs). Personally I would add the value of keywords to the Description, because Google will highlight them in bold (for now) because they partially coincide with the search term. And with regard to blog posts, freshness of content is once again important, as Google now includes the publication date in the snippet. Nor should we forget the classics: keyword in the title and URL, albeit always in moderation! And last but not least: rich snippets. We all know that a search result with star ratings is much more appealing. And if the snippet contains additional links – even better! No microformat is too small if it helps us stand out. In other words, adapting the content to suit the user’s search intentions for each type of Google search. It sounds obvious, but the majority of the websites we audit today are lacking in this area more than any other. And the outcome usually takes the form of unrealistic positioning expectations. We need to adapt the content to meet the search intentions: not just any user’s intentions, but those of the target user, the one who might become a conversion, whether s/he is further up or further down the funnel. For example: an apartment booking office might define its target user as women aged from 25 to 50, given their purchasing power and Internet usage habits. First we should think about conversion, and the type of user who could complete the objectives of our website. Once we’ve done this, we then need to detail the ways and routes that can lead to this conversion of objectives. For example: maybe we can determine a clear route that starts with initial brand contact via the blog, loyalty-building via the newsletter and the impulse purchase of a package holiday following a seasonal push. By having a clearer view of those user routes and the user’s search intentions for each case, we can achieve much more solid keyword research. Once we have a good set of keywords, I always recommend segmenting them by personalized search type and by the type of content we plan to generate. For example: we need to distinguish between groups of keywords that could lead to articles on a travel blog (i.e. a more informational intention) and others that could help optimize the pages for different package holidays (i.e. a more transactional intention). When doing keyword research, we need to simulate ambiguous searches in order to understand what the majority of users who performed that search wanted. Now Google is giving us that information for free, and we can also get ideas for generating new types of content. 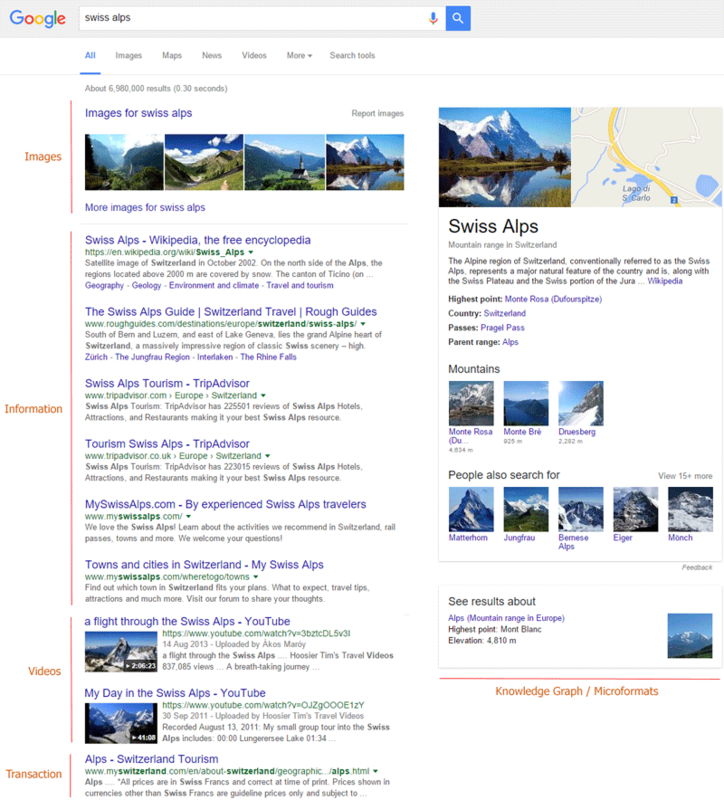 For example: if we’re not sure what a user who searches for “swiss alps” (2,400 searches per month in Spain) wants, we can go to the SERP, where we’ll find out that it’s a good opportunity to generate quality content and even try some visual items (images as well as videos), as they’re in high demand from this type of user. On the other hand, Google has also detected via user signals that this particular search doesn’t have a great deal of transactional potential. By adopting this process we can achieve a website architecture and content strategy that meets the different needs and search intentions of the users that interest us, in terms of conversion and objectives. Finally, we shouldn’t forget about optimization factors related to user experience, such as usability. If the experience is positive, the risk that the user will leave and look for another site is reduced. The rules of SEO have changed for good. It’s no longer enough to (over)optimize our pages based on keywords or obtain as many links as humanly possible. 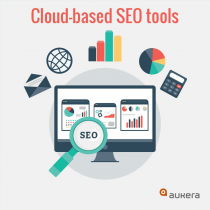 It will become increasingly necessary to take semantic factors and Google’s use of content entities into account, as the search engine continues to learn how to relate different concepts to one another and interpret how they are connected. Like a small child, it’s starting to “learn”, and like a small child it will continue to learn and grow. Be scared! The fight between brands will take place in the arena of their real-life reputations and Google will continue to interpret mentions (not just links) and distinguish between the companies that the user loves and hates. The trust rank (and other rankings) will become increasingly more important and source credibility will be valued based on more human criteria. And, as we’ve already explained, the user will always be at the forefront. The trend will be not only to understand the search intention, but to foster positive interaction with the brand in all areas, offline as well as online, paying attention to detail and ensuring we become the user’s favorite. An SEO technique for the next five years? Exclusive posts about Analytics and Digital Strategy in your mailbox.